I felt totally sick and I started crying, in the middle of Starbucks, where I sat reading on my phone, before I even clicked the link — and even though my heart was already broken for what the link would tell me, I had to click it. You see, Sara had a disease called Ankylosing Spondylitis which made her life so difficult and ultimately lead to her death. Basically, she had an autoimmune disease that caused her immune system to attack itself. She ached and was sick so easily that she was housebound for the last years of her life without being able to leave or even open a window. I can’t even imagine. Yet Sara had so much joy. It overflowed from her, even in the midst of her very real pain. She had joy from a God who created her and used her despite the severe limitations of her body. Sara is getting ready to head home to Him. I am writing this from my phone, and with tears rolling down my face no less, so forgive any typos or other mistakes. There’s a girl whose blog has inspired me over the years. I’ve never read her blog regularly, but every few weeks or months I go back and catch up on all that I’ve missed. Tonight I happened to see a tweet from someone that mentioned this girl’s blog and a posted entitles “Going Home.” My heart sunk because the girl, named Sara (or Gitzen Girl) has a very serious disease that negatively affects all of her body, and as she’s gotten older, the disease has gotten progressively worse. She is homebound and hasn’t been outside in several years due to her health. So a post about going home causes fear because when you’re homebound, there’s only one other place you can go, and that’s Home. You know. The capital H kind. The Home that Jesus paid the mortgage on thousands of years ago. I made my way over to Sara’s blog reluctantly as I sat in Starbucks waiting to pick Charisse up from cheerleading practice. And to the great sadness of my heart, Sara IS making her way home. As her body shuts down, hospice has come in and is keeping her comfortable and at peace, and she will soon be with Jesus. Restored. Transformed. Whole and healthy, without the physical limitations this earth has put on her. I cry for many reasons. The first is that I don’t want to go Home young. I know that’s not very cool-Christian of me to admit and I have never really shared this before, but even though I know Heaven is so much more amazing than my mind can fathom, I want to be here to get married and have babies and she Charisse grow up and have babies. Just like Sara did. But at the same time, I weep because, sick as she was, Sara always chose joy in her life. Sick and in pain, Sara worshiped God to her fullest ability and was able to turn a serious handicap into the work of God. I pray that I can live my life like that: in joy and in honor to the extreme. and I pray that you’ll join in my prayer as Sara makes her way to her Home. Shannon here to let everyone know that at 11:14 pm tonight, Sara died peacefully with her mother and brother at her side. It hardly seems fair. She had so much ahead of her. But she still does. She has eternity with Jesus and I love that truth. I love that I have the same truth to hold onto and that some day, dancing before our God, I will get to meet Sara face-to-face and tell her how her love for the Lord inspired me and touched me so deeply. Life has been kind to me, but it’s also been terribly ugly. But you know what? 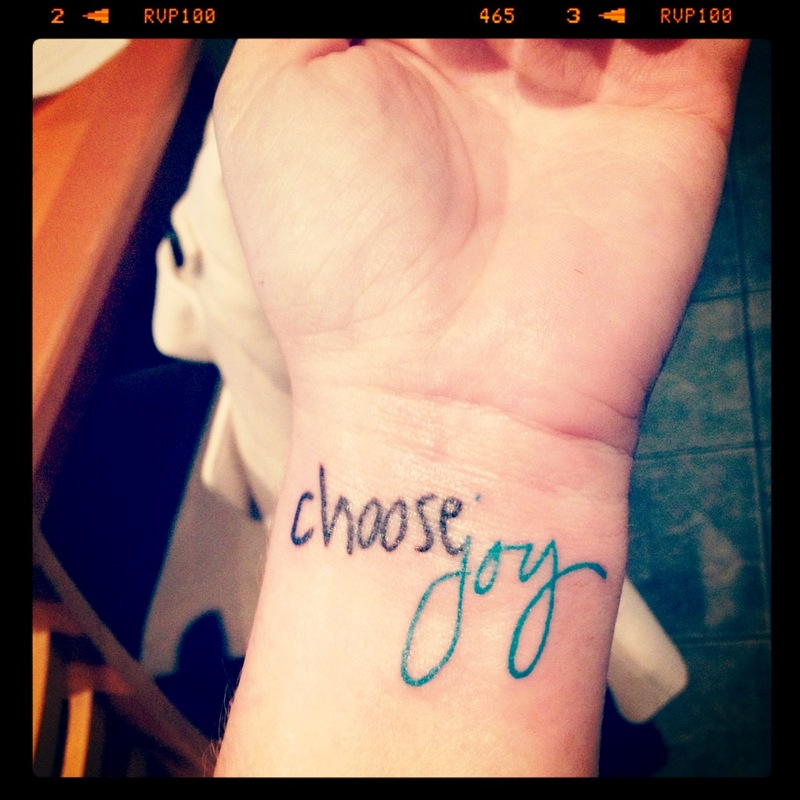 I can’t choose all of the things that happen to me, but still: I can always choose joy. That’s why I decided to get a tattoo on December 22. I wanted to remind myself quickly whenever I’m in need of an attitude adjustment — which is preeeeety often, if we’re being honest here! — that despite my circumstances and my own pain and discomfort, God has given me the choice to look to Him and find my joy. If my young, healthy body is pain-free and I am able to move comfortably, I have so much more than Sara knew in her final days and hours — yet she chose joy. If I can take walks and leave my home to work and run errands, I have so much more than Sara — yet she chose joy. Yet I often do not see that choice. I have a bad attitude and I take my anger and emotions out on others.